Up in Monetier, we had 1,500 fun units (aka metres) in the bank which we slowly cashed in over the following few days as we rode out of the Alps. 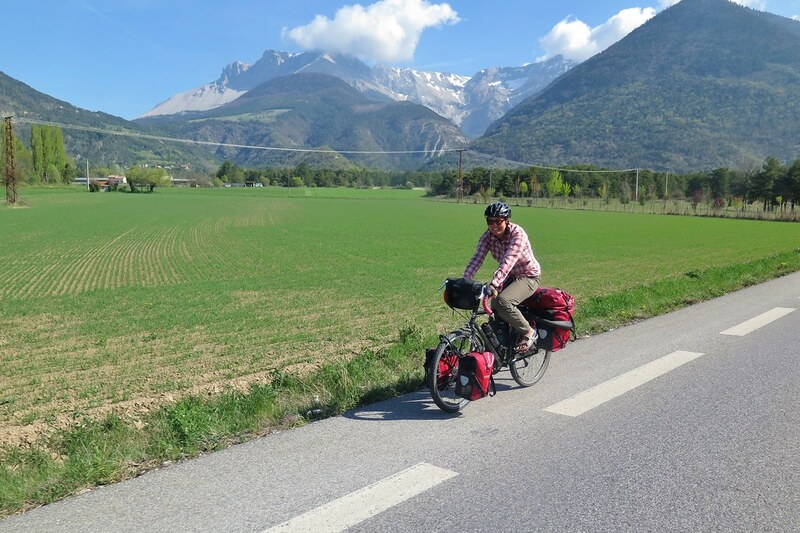 Initially we backtracked as far as Briancon, then continued south towards Gap. It wasn’t all coasting downhill though, the road still dipped and climbed, and the headwind picked up at times but, generally, we were losing altitude. 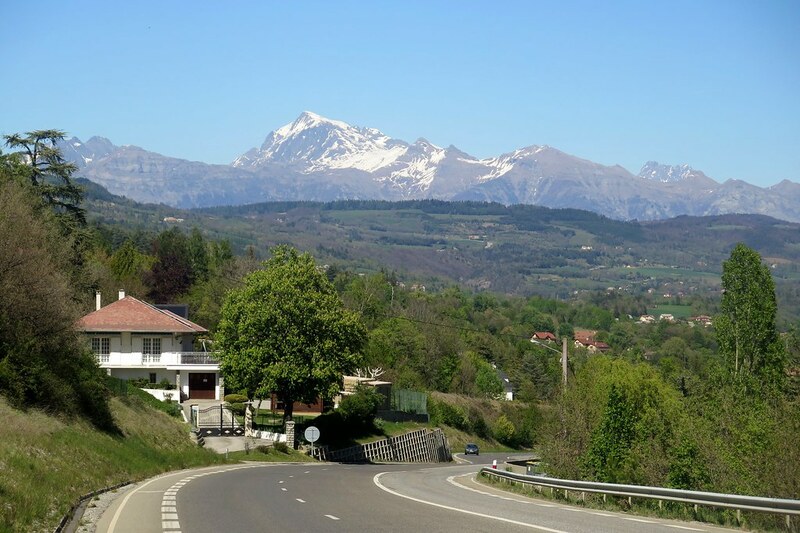 On our first day, we got as far as the old fort town of Mont-Dauphin and the turn off to Risoul and Queyras ski areas when the headwind really started to get strong. We decided to think about camping for the night so I cycled up a side road to find some water, leaving Clare waiting for me near a roundabout. When I returned, she’d made some friends (she’s very friendly!) – a couple had pulled over in their car and were chatting beside the road. 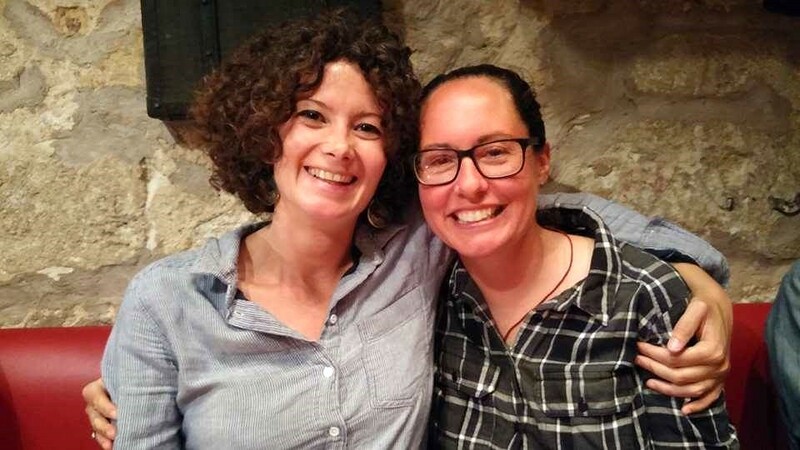 Marion and Baptiste introduced themselves in perfect English, then invited us to stay at their place just up the road, in Guillestre. We were pretty blown away. That’s the kind of thing that happens in Iran, or Central Asia isn’t it? No one in Western Europe would just invite strangers off the street into their home, would they? We were happy to take them up on their offer, so followed their directions to their aparment a few kilometres away. 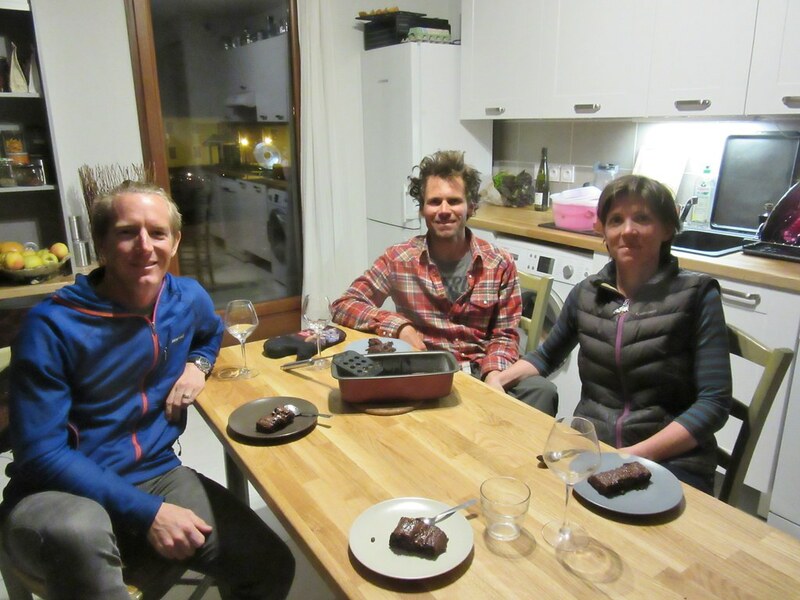 We had a really nice evening with Marion and Battiste, finding many common interests in skiing, cycling and adventure in general. They cooked us dinner, made up their spare room for us and then waved us off in the morning feeling very lucky to have chosen that particular roundabout to wait at. 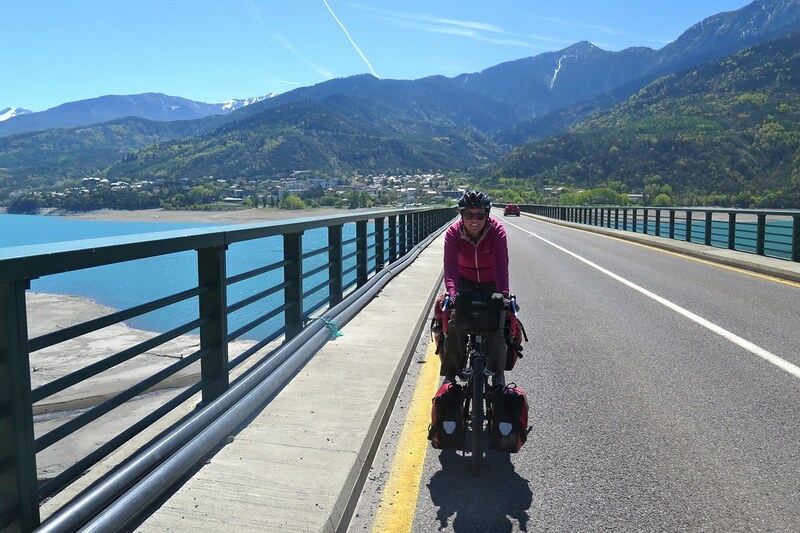 We continued downhill to the Lac de Serre Poncon, looking very blue against a mountainous backdrop. 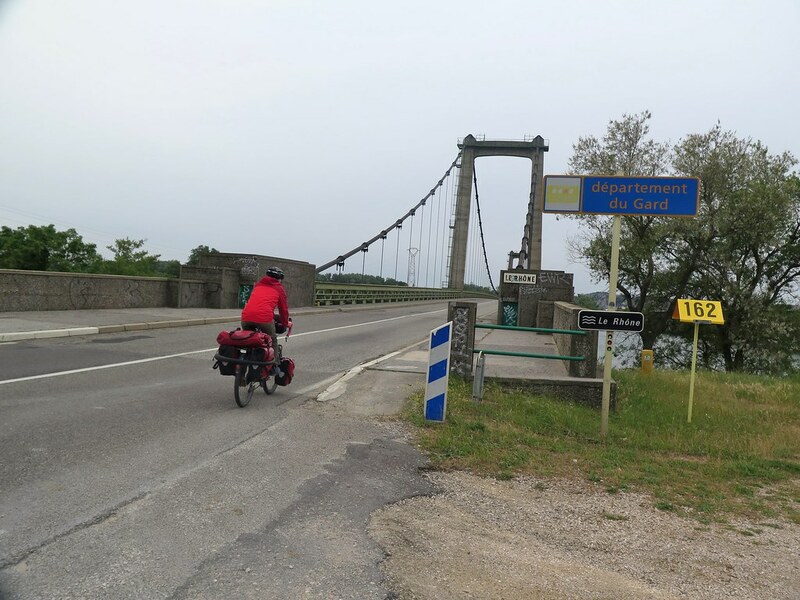 We crossed a bridge and passed the famous chapel on an island in the lake, then stopped for some lunch in one of the many roadside picnic areas that seem to be everywhere in France. Then it was on to Gap, the main town in this area, which sits in a valley at about 700 metres. We only stopped to fill up on water, then left town to the west to get up and out of the valley to find a campspot. It was a bit of a climb, nearly 300 metres up and on to a plateau near La Roche des Arnauds. We’d left the main N94 route at Gap and were onto a much quieter road. 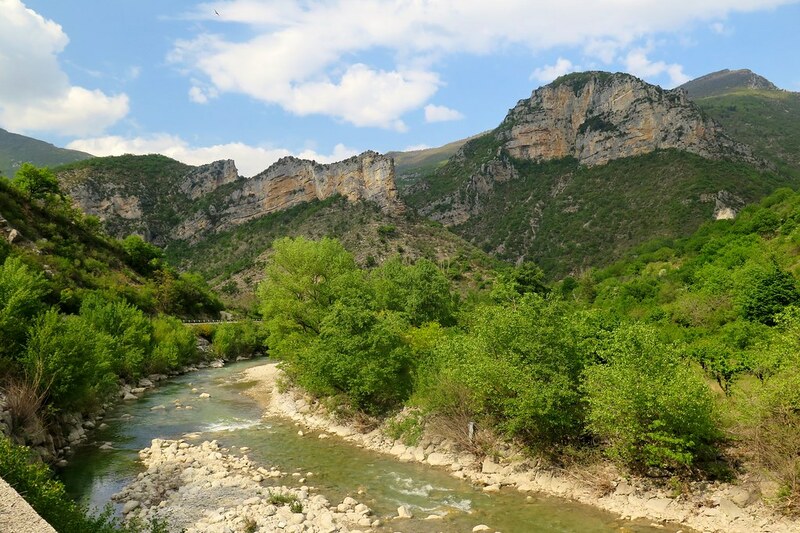 It passed through a very empty and beautiful area to the north of Mt Ceuse where we pulled off the road into a pine forest to pitch the tent for the night. The wind was working in our favour the following morning, so we had a very easy few hours riding downhill at a good pace. 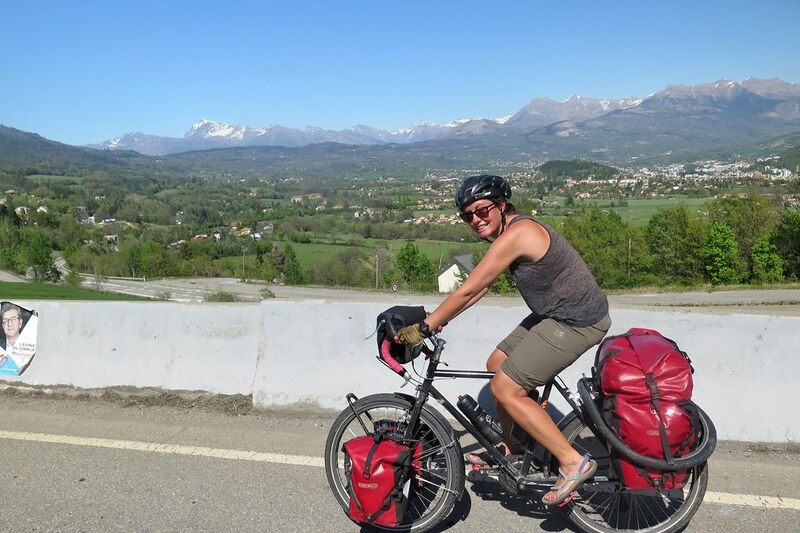 We left the last of the snowcapped Alps behind us, and soon were riding through the classic rocky hills of Provence. The first of many vineyards started appearing too. 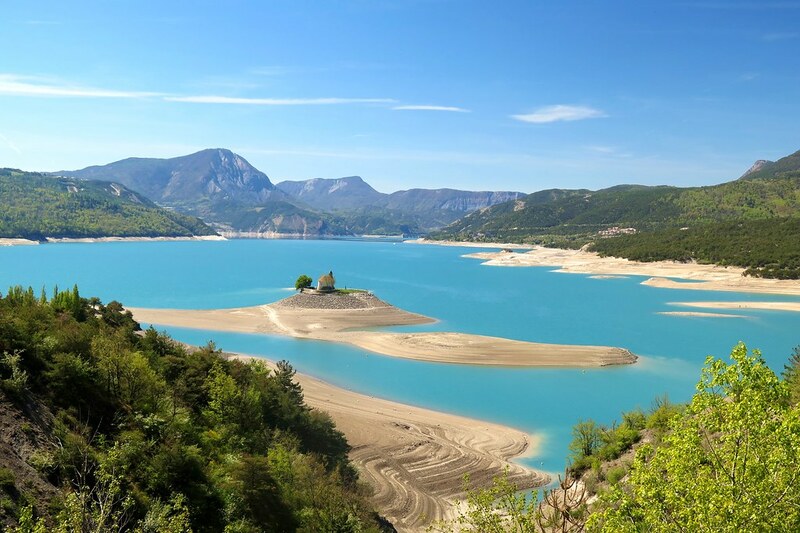 When we asked for some advice on where we should go from the Alps, some friends had said the Gorges du Verdon was a must see. I’ve been there before some time ago, and would’ve liked to have gone, but unfortunately, it’s just too far south. 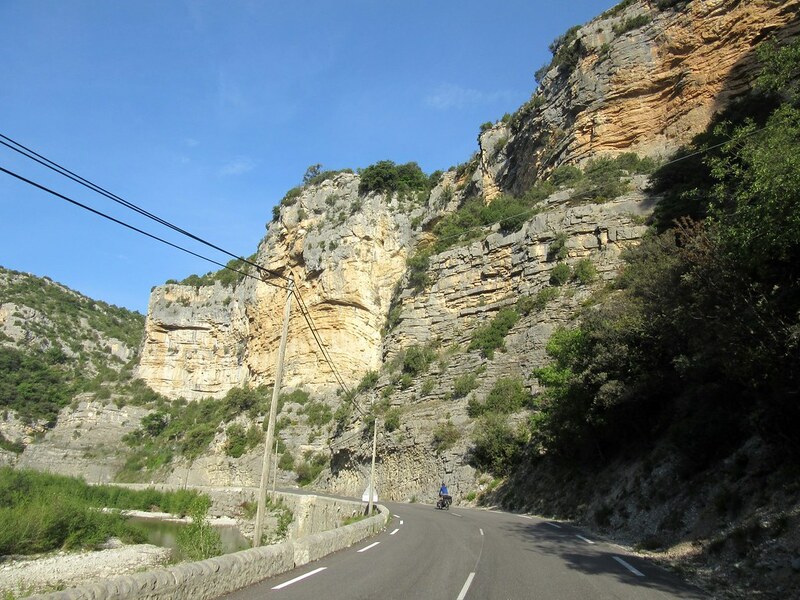 It was a bit disappointing, but after we passed Serres, the hills started closing in on either side of the road and we entered the beautiful but unknown to us Gorges de St May. One of those nice flukes of random route planning. We were still coasting downhill, following a river downstream, meandering our way between the cliffs. Thanks to the wind and the downhill, we’d covered a decent distance that day, so we decided to camp in the gorge next to the river. 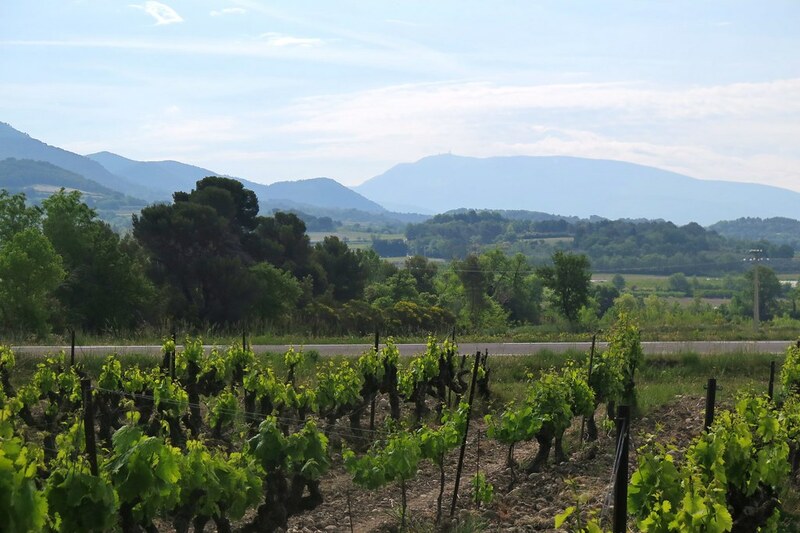 Emerging from the gorge, we were onto a wide plain and in another major wine growing area, the Cotes du Rhone. 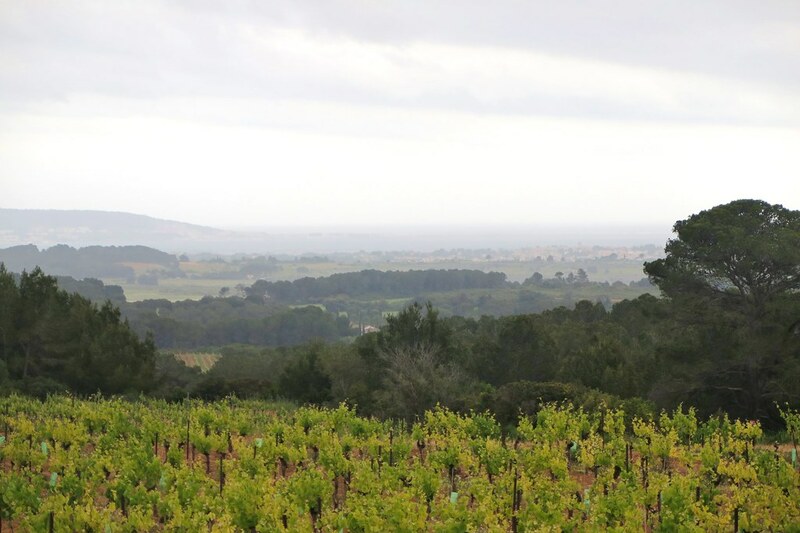 Every village was surrounded by vineyards and wineries promoting their produce. 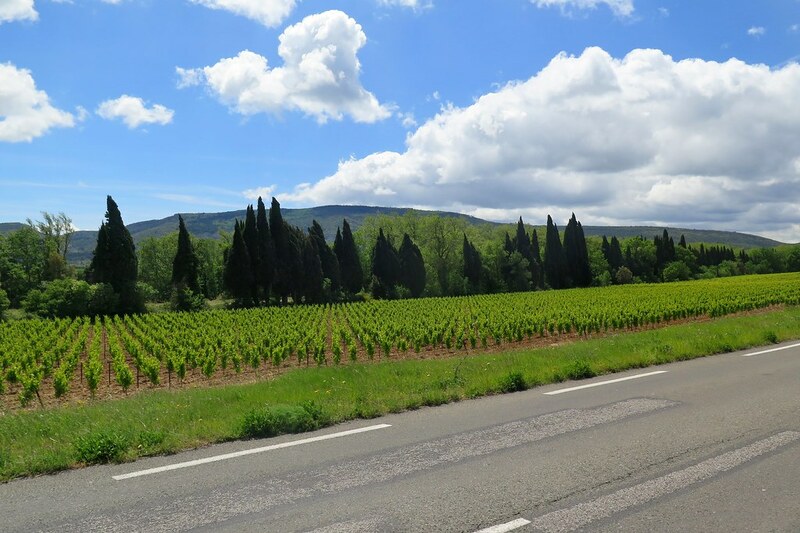 Like the Chianti region in Italy, it would be a perfect area for a short trip by bike, cycling between the vineyards, tasting wine. 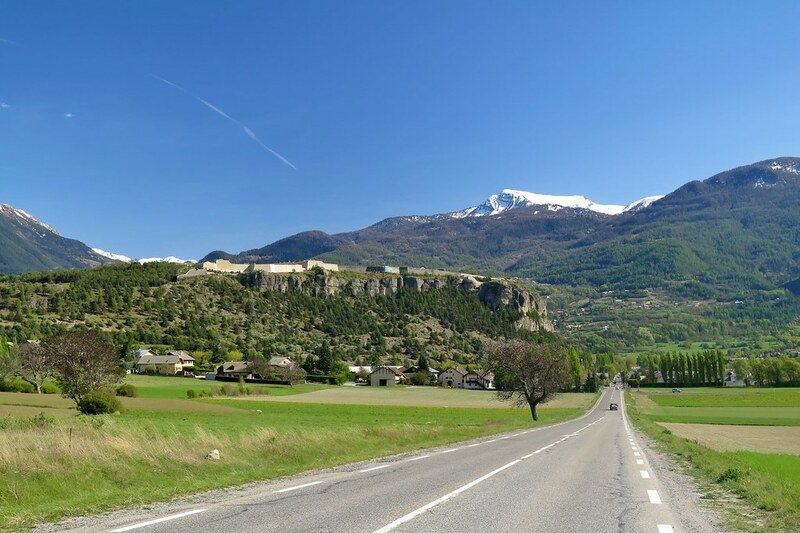 To the south loomed Mont Ventoux. 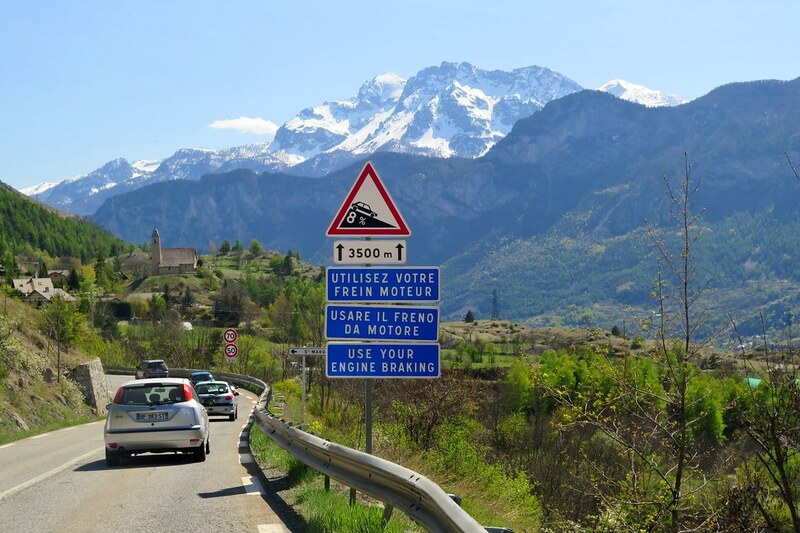 I’m not really a keen follower of bike racing, but I know enough to have heard of the famous climb. It was almost tempting to tackle it on touring bikes, just for bragging rights. 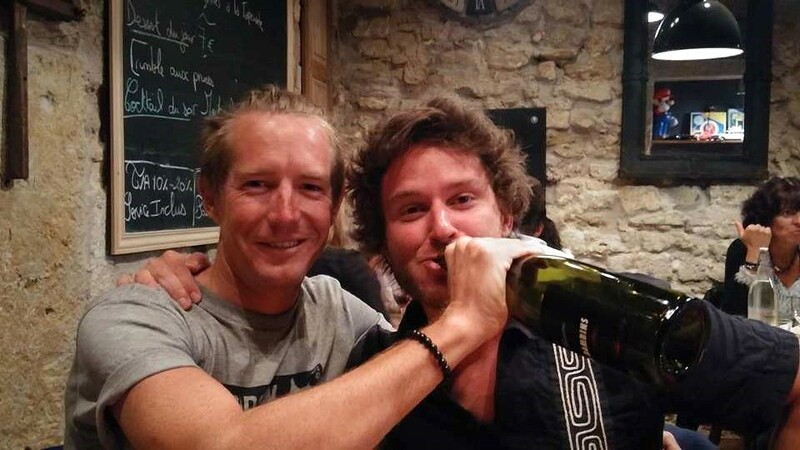 We’ve climbed enough mountains though, and taken our bikes up to over twice the altitude of Ventoux, so don’t feel like we’ve got anything to prove! The weather was starting to change too, and rain was on its way. We picked up the pace and pushed to get to Orange and into a dry hotel room. Our timing was good, and we smugly spent the night indoors, listening to the rain lashing down outside. 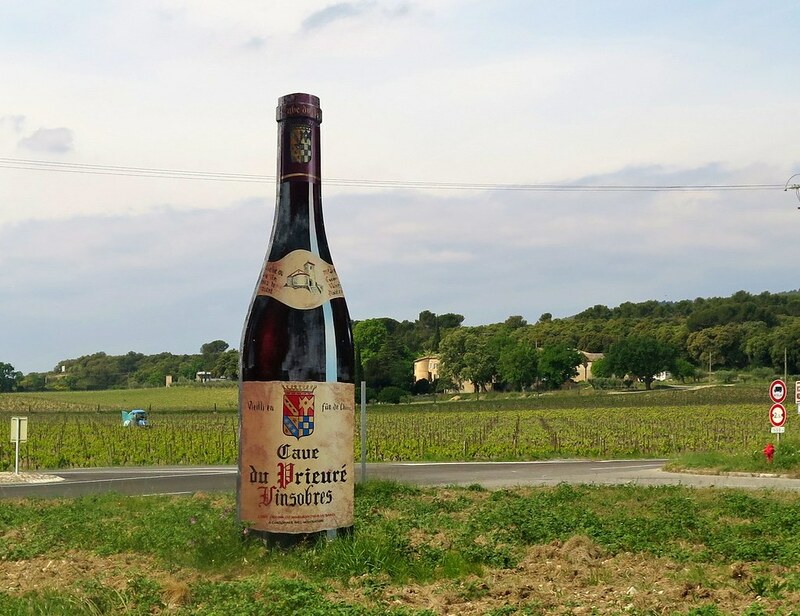 South of Orange, we crossed the Rhone on a grand old suspension bridge near Chateauneuf du Pape. The skies were still grey but they started clearning through the day. 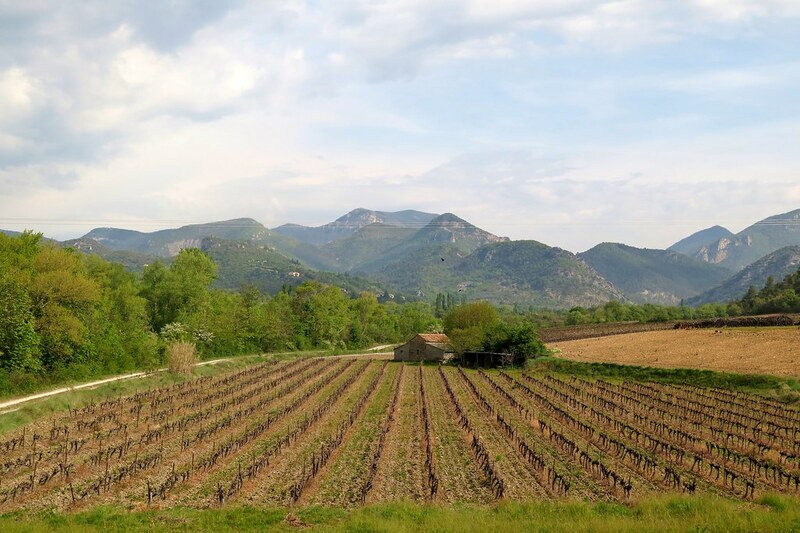 We were heading south west towards Nimes and then Montpellier. We tried to stay off the main roads where possible, at times taking us through really lovely rolling landscapes. At others, there was no choice and we were stuck on busy national routes, keeping as far right into the narrow hard shoulder as we could. We stopped for lunch in a park outside Nimes where we saw some picnic shelters. The wind was so strong that we needed their protection just to light the stove. Luckily it was blowing in our direction so our progress had been good and we covered decent distances. 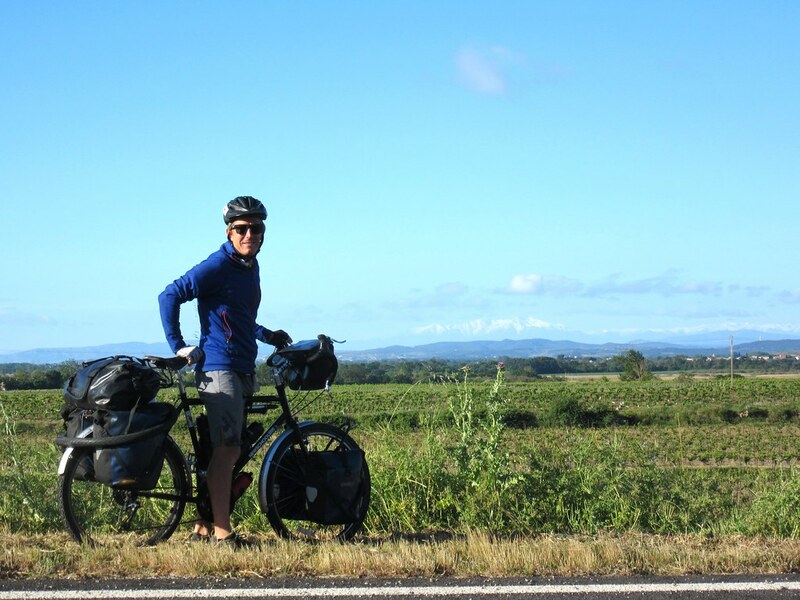 Later in the afternoon the sky cleared and we left the road, rolling the bikes into shrubland to look for somewhere to camp. 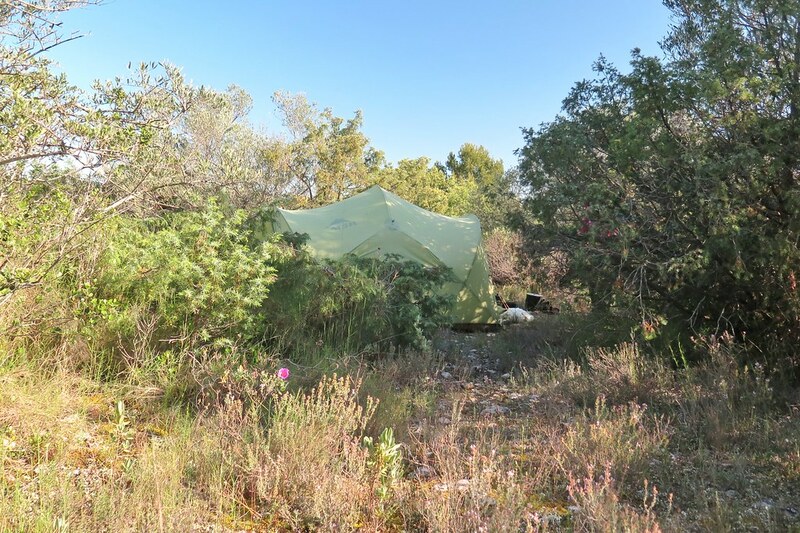 The spot we found was perfect, with the smell of wild thyme from the bushes all around our tent. As we got close to Montpellier, we passed a big hypermarket complex and decided to stop in at the McDonalds there to use the wifi. Randomly we picked up a message from Tim and Claire (who we cycled with in Central Asia) showing a photo of them in Montpellier. They were in town for the weekend as Tim was taking part in a swim/trailrun event in the nearby hills. A few more messages were exchanged, and plans changed a bit. 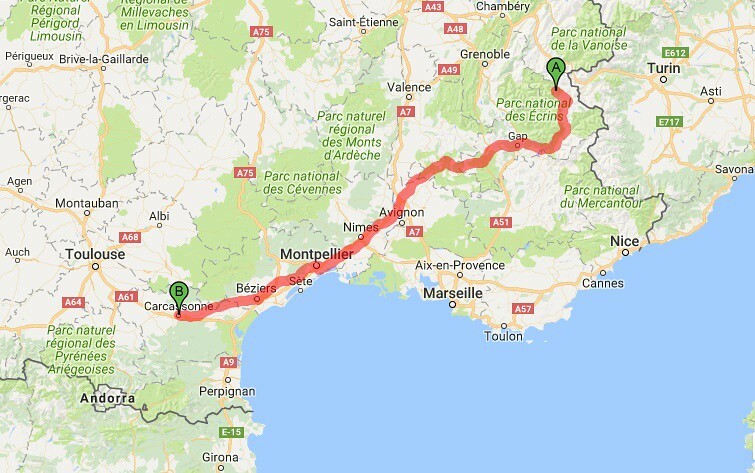 Instead of heading down to the coast and taking that route to Carcassonne, taking three days, we decided to hang around and spend the evening with Tim and Claire, then make up the distance in two days. 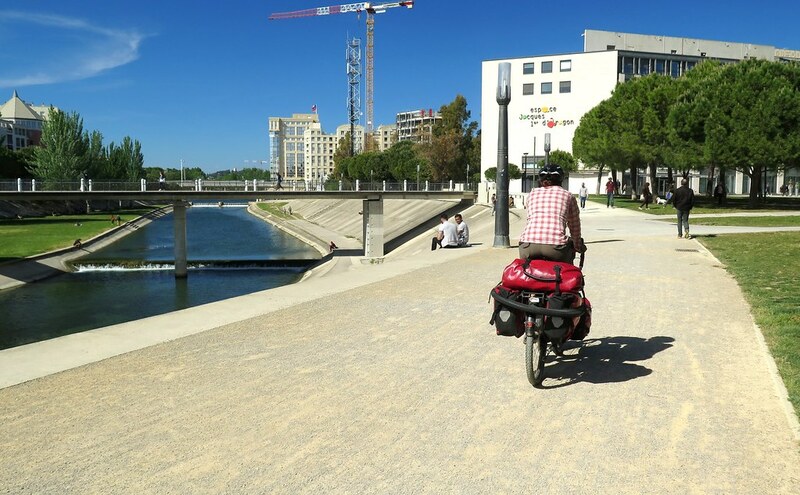 We killed time for a few hours – a picnic lunch, lazing in the sun next to the river on the outskirts of Montpellier, then rode in to the city centre. We last saw the Frenchies in September in Khiva, Uzbekistan. We’d spent a lot of time together in that area, cycling for a number of sections through Kyrgyzstan and Tajikistan, so it was great to see them again. We had the rare treat of a Saturday night out in their old hometown (they now live in Toulouse), drinks and a delicious French meal. We spent the night on a blow up matress in their Air BnB, and woke to rain in the morning. 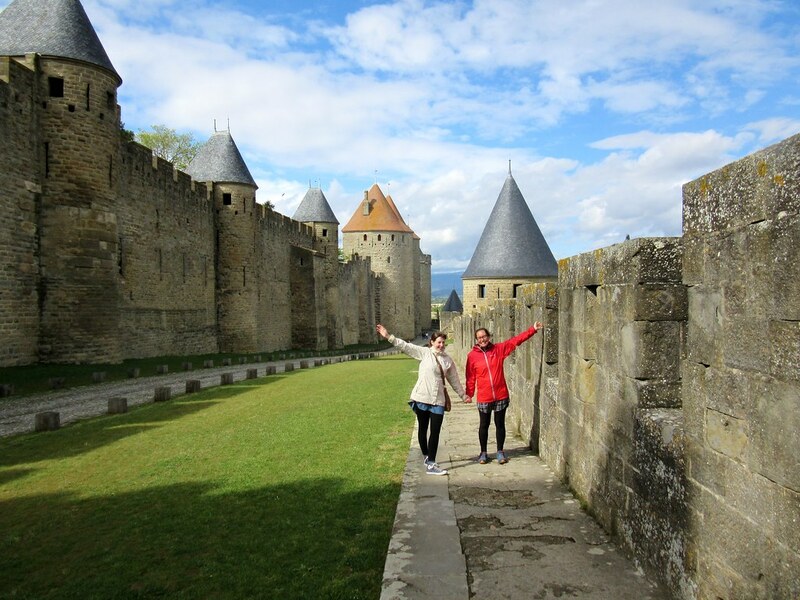 We had to get to Carcassonne by Monday to meet a friend, so with the rain and building headwind, we were in for a couple of tough days at the office. There wasn’t a whole lot to look at, so we put our heads down and got on with it. Leaving Montpellier we lucked in and found a sealed cycle path which we were able to follow for about 20km. Then it was up and over some hills, unexpected and quite steep at times. On a clear day the views would’ve been really good as we could just about see down to the Mediterranean, the first time we’ve seen the sea since we were just north of Naples. 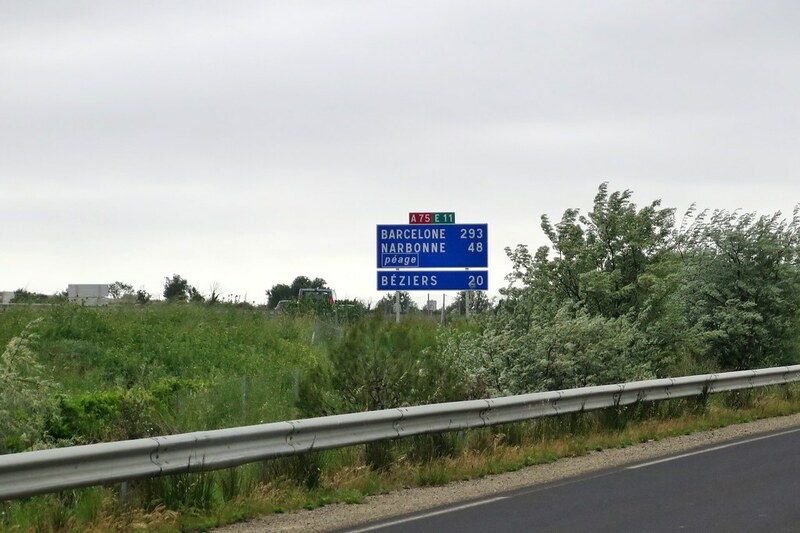 Our road ran close to the main autoroute, and we saw signs for Barcelona, less than 300km away, we really are quite far west now! 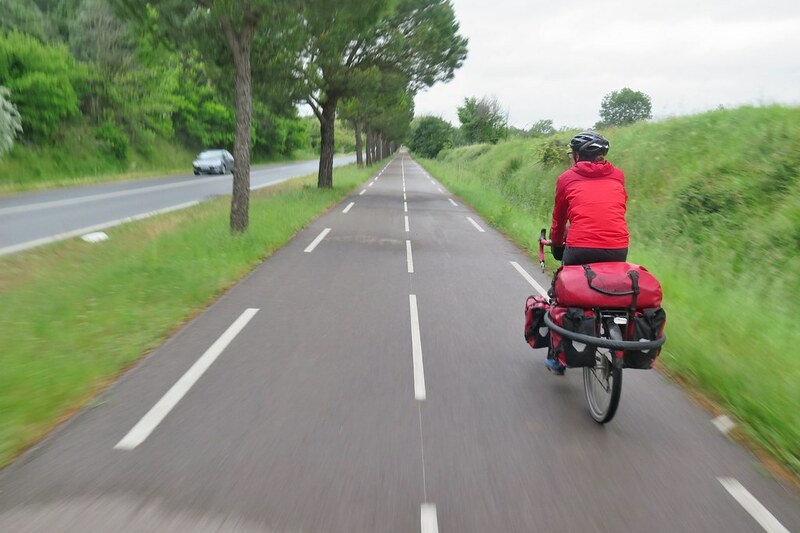 Our aim was to get through Beziers, to camp next to the Canal du Midi, about 90km for the first day. 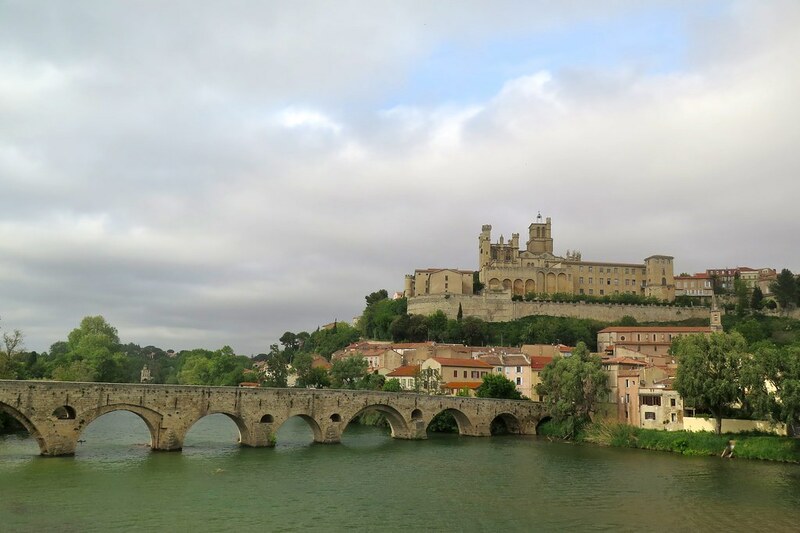 Beziers looked like a nice town, with big castle on a hill overlooking the river, but we didn’t stick around for longer than a photo. Another 10km out of town and we reached the canal. On one side, there’s a cycle path, but we pushed through the tall grass on the opposite bank to pitch our tent, just in time before more rain started falling. A lot of rain fell overnight, then all was quiet in the morning, until we were woken by two cars and a van full of fishermen driving up the canal past our tent. Seems like we’d found a prime fishing spot to camp in. We packed up quickly and hit the road. 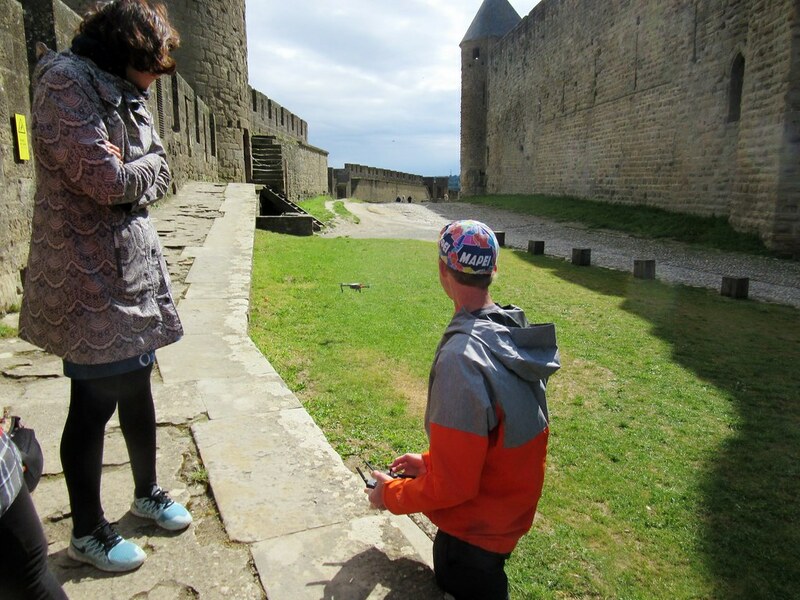 Our friend Jen’s flight was landing mid afternoon, so we wanted to get to Carcassonne in time to meet her. It was a beautiful morning and we could see all the way down to the snowy peaks of the Pyrenees in the distance. The headwind was still there though, stronger than ever. The trees were all tilted slightly towards us, so it seems like the wind is consistently stong in the area. If we had more time, we would’ve followed the cycle path along the canal, but we needed to take the main road. It took us nearly five hours to cover 65km, but we made it. Wow, and nice cycling lanes!! And what a drunk face! Hahahahaha!! !